This LED Color Changing RGB Floodlight is great for building highlights, adding colour to landscape lighting projects, For washing colour onto walls, for lighting display and booths to grab attention. 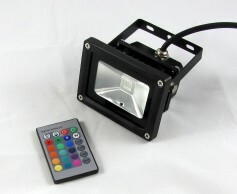 Colour Changing RGB LED Flood Light that includes 1 RGB IR Controller. This Durable, designed for outdoor RGB Flood is 12V DC and draws 10 Watts. Powder Coated Black Housing with built in IR Sensor. Remote Control, has 16 Static Colour options, 4 dynamic modes, including smooth transition, Fade, Strobing LED light and Flashing light. Dimming and OFF and ON switch is also on this remote. Size: 4.5" x 3.55 x 3.5"